Chances are your visit to Halong bay will likely involve an armada of small boats jammed with backpackers and local tourists navigating the waterways between the limestone outcrops that make up Vietnam’s most recognizable landmark. 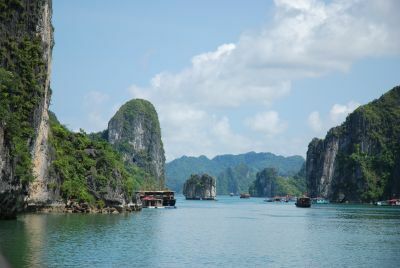 But if you’re interested in seeing some other just as interesting but less crowded sites, Lonely Planet has a few other suggestions on what to see beyond Halong Bay. For example, if you have time, head to nearby Cat Ba Island whose southeastern shores are home to its own limestone islands with isolated beaches, and where boat operators are likely to charge you a fraction of what you’ll pay in Halong. Bai Tu Long, further north along the coast from Halong, promises to be noticeably less crowded than Halong, and features its own stunning landscapes and outdoor activities like hiking and cave exploring. For more ideas check out their full article.